"Best of All: Small One"
The song has become the most popular recording of all time, and its story goes back even further than Bing's debut rendition of the tune on the Christmas Day edition of Kraft Music Hall in 1941. Bing took over hosting duties on Music Hall in January 1936 and had the first of many Christmas specials. In fact, there was a Bing Crosby Christmas Special on the radio every year from 1936 until 1962 when the Golden Age of Radio came to an end. During his first few years with Music Hall, and even after recording "White Christmas", Bing's signature Christmas song was "Adeste Fideles/O Come, All Ye Faithful". Sung in both English and Latin, the carol was a perfect showcase for Crosby's bass/baritone stylings. Bing's next great contribution to the Great American Christmas Songbook had its genesis in January 1940 when Irving Berlin rushed into his office, calling for his musical secretary to transcribe what he called, "The best song I ever wrote…the best song anybody ever wrote." With hits like "Alexander's Ragtime Band", "Cheek to Cheek", and "God Bless America" to his credit, Berlin certainly knew what he was talking about. That spring, Berlin signed a contract with Paramount to provide songs for a musical picture about an inn which was only open on public holidays, Holiday Inn (1942). The film starred Bing along with Fred Astaire and began filming in November 1941 (Astaire was scheduled to co-star with Crosby in the film version of White Christmas but thought the script was bad and asked to be released from his contract). When Bing was preparing that year's Christmas special for Music Hall, borrowing from his latest picture was natural. The fact that "White Christmas" is as melancholy as it is nostalgic certainly fit the country's mood of the first Christmas of America's involvement in the War. Part of the song's melancholy tone comes from the fact that Irving Berlin, a Russian Jewish immigrant who did not observe Christmas, had been visiting the grave of his infant son who died on Christmas Day, 1928. The nostalgia of the then new Christmas song was what caught the listening public. "White Christmas" became one of the most requested songs on the Armed Forces Radio Services. After premiering it on Music Hall and performing it in Holiday Inn, Bing cut the song for Decca Records in May 1942. The song was so popular that the master disc wore out from re-release pressings and Bing made a new cut (with the same musicians) in 1947, the version which is heard most often today. "White Christmas" and "Adeste Fideles" are hardly Bing's only contributions to the Holiday Season. Veterans called Bing the biggest influence on raising morale during WWII, even more than FDR, General Eisenhower, or Bob Hope. In addition to their weekly programs, Hope and Crosby made dozens of Christmas Broadcasts for AFRS. Bing's first wife, singer Dixie Lee and their four sons appeared on the 1950 Chesterfield Program Christmas special, the only time Dixie appeared on the radio with her husband before she died of ovarian cancer in 1952. Bing made his first TV Christmas appearance as a guest on Frank Sinatra's weekly show in 1957. It was a special enough occasion that Sinatra had the episode filmed in color years before ABC began color broadcasts. The program closed with "Old Blue Eyes" and "der Bingle" performing a duet of "White Christmas". It was hardly Crosby's last notable Christmas duet. 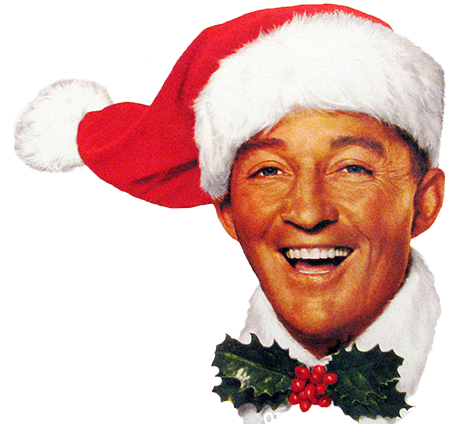 In later years, Bing was taping what would be his last Christmas special, "Bing Crosby's Merrie Olde Christmas" for CBS, and among his guests was a rock and roll star named David Bowie. It has been reported that Bing had no idea who Bowie was, but the Crosby children were big fans and very excited that the rocker was going to perform a duet with their dad. Things started off badly when Bowie and his wife entered the studio wearing matching full-length mink coats, matching flaming red hair, and matching make-up. The producer quickly convinced David to get rid of his earrings and lipstick, but Bowie put his foot down when he was informed that he would be singing "The Little Drummer Boy", saying, "I won’t sing that song. I hate that song I’m doing this show because my mother loves Bing Crosby." The show's music writers quickly composed a counter melody, "Peace on Earth". When it was time to actually record the number, there was still a lot of nervousness in the studio, but as they gathered around the piano, Mary Crosby remembers, "Dad realized David was this amazing musician, and David realized Dad was an amazing musician. You could see them both collectively relax and then magic was made." The result has become a holiday standard. Thank you again for your very personal help finding these OTR shows. Amazing service is so rare in these days of internet dehumanization! Very best wishes for Christmas and the New Year! The best to you and your family this wonderful time of the year. Thank you for all the joys of listening to Old Time Radio. Thank you kindly. Enjoy the holiday season. You give us enjoyment through out the year. I was really pleased that you were able to include the 1955 Christmas Sing with Bing Around the World on your most recent Bing Christmas Update collection. 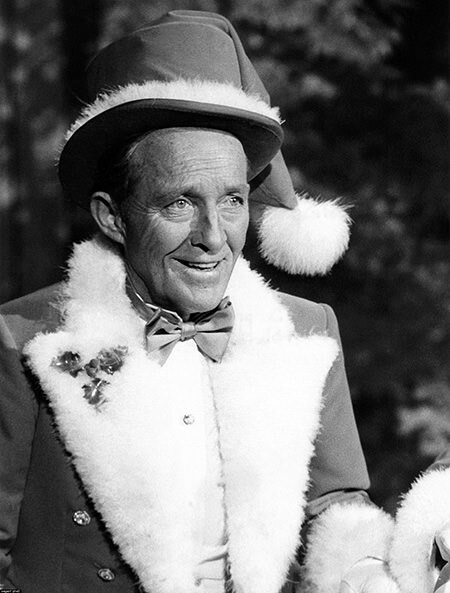 It’s my favorite of all the Bing Crosby Christmas shows; Bing being more himself than a mediocre comic. The 1943 Kraft Music Hall with guest Phil Silvers is remarkably clear-sounding. And the smooth addition of the song White Christmas at the end, only about a year old at the time, indicated that it was already so popular that it didn’t need a n introduction. And I’ll even add here that the album Bing made for AFRTS was nice and clear. Not sure if copies were sent to military personnel like the V Discs, but it was great.